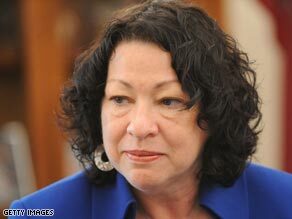 WASHINGTON (CNN) -- Judge Sonia Sotomayor continued making the rounds on Capitol Hill Wednesday, meeting several additional U.S. senators who will help decide whether she becomes the country's first Hispanic Supreme Court justice. Judge Sonia Sotomayor is scheduled to meet with 10 senators her second day on Capitol Hill. At the same time, one leading Republican backed away from earlier heated criticism of Sotomayor in which he labeled her a racist. The shift appeared to reflect an ongoing debate within the GOP on how best to critique Sotomayor without alienating women or Hispanic voters. Former House Speaker Newt Gingrich said he initially reacted too strongly after reading a 2001 speech by Sotomayor in which she said she "would hope that a wise Latina woman, with the richness of her experiences, would more often than not reach a better conclusion than a white male who hasn't lived that life." Gingrich wrote last week on Twitter that Sotomayor's remarks were racist and that she should therefore be forced to withdraw as President Obama's nominee. "New racism is no better than old racism," Gingrich wrote. "White man racist nominee would be forced to withdraw. Latina woman racist should also withdraw." On Wednesday, however, Gingrich released a lengthy op-ed that seemed to back away from his initial response. "My initial reaction was strong and direct -- perhaps too strong and too direct," Gingrich wrote in the conservative publication Human Events. "The sentiment struck me as racist and I said so. Since then, some who want to have an open and honest consideration of Judge Sotomayor's fitness to serve on the nation's highest court have been critical of my word choice." Gingrich added that "the word 'racist' should not have been applied to Judge Sotomayor as a person, even if her words themselves are unacceptable." Gingrich's change in sentiment was immediately praised by Alabama Sen. Jeff Sessions, the ranking Republican on the Senate Judiciary Committee. "I'm very glad he backed off," Sessions told CNN. "I think that will help us have a real good discussion about the serious issues that the nation faces and the court faces." Sessions added that he has "been troubled as I looked at her record as to whether or not she's an activist ... (but) I just haven't felt that it's appropriate to make those kind of strong statements about her." Other leading conservatives have also reacted harshly to Sotomayor's record. Popular radio talk show host Rush Limbaugh labeled her a "reverse racist," and former Colorado Rep. Tom Tancredo asserted that her association with the Hispanic group La Raza was the equivalent of a membership in the Ku Klux Klan. Some political analysts have warned that the Republicans are risking putting themselves on trial in front of Latino-Americans. "If they line up uniformly in hostility against the first Hispanic woman (nominated) to the court, they risk paying a terrible price with the biggest and fastest growing minority in this country," CNN political analyst David Gergen said. On Tuesday, leading Senate Democrats tried to quell the controversy over Sotomayor's Latina remarks. Sen. Dianne Feinstein, D-California, said the judge told her the remarks were a "poor choice of words." Senate Judiciary Committee chairman Patrick Leahy, D-Vermont, said Sotomayor told him that "of course one's life experience shapes who you are, but ultimately and completely ... as a judge you follow the law. There's not one law for one race or another. There's not one law for one color or another. There's not one law for rich, a different one for poor. There's only one law." Leahy also ripped Sotomayor's critics for launching "the most vicious (attacks) I've ever seen." He said the Judiciary Committee's confirmation hearings would not begin until after June, but "with the attacks that have been going on against her, I believe it'd be irresponsible to leave her hanging out there." Senate Majority Leader Harry Reid, D-Nevada, was noncommittal when asked about a timetable, saying only that "we're going to do this as quickly as we can (but) won't set any arbitrary deadlines." Obama has called for his nominee to be confirmed before the start of the next Supreme Court term in October. Sotomayor is slated to spend her second day on Capitol Hill meeting with 10 additional senators including Sens. Judd Gregg, R-New Hampshire; Barbara Mikulski, D-Maryland; Olympia Snowe, R-Maine; Herb Kohl, D-Wisconsin; Sheldon Whitehouse, D-Rhode Island; and Ron Wyden, D-Oregon. She also is expected to meet with Republican Sen. Lindsey Graham of South Carolina, who has called on her to apologize for her Latina comment. Graham recently called the comment "troubling and inappropriate." "She's going to have to convince me that if I found myself in court against someone she had a lot of empathy for, that I'd get a fair shake," Graham said. "If she can't, I won't vote for her."